Hello world and welcome to post two of my weekly blog of Skerat’s Synthtronica news. Well last week I gave you all a little bit of an insight into myself and this week let’s move onto some information about the actual shows. First up how did Synthopia come about and why did I move onto creating a new show called Skerat’s Eclectic Podcasts. 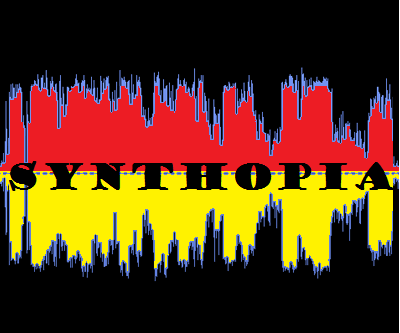 Synthopia began its life as an internet radio show, on the UK’s 1 Radio. I was collaborating with one of the DJ’s on 1 Radio, who had a show called Club 80’s which was essentially Italo Disco and Hi Nrg music, but also at times Synth-pop. My role was to manage a weekly chart that I created for the music genres, which Will the DJ thought at the time would be a great to bring to life on his show. The chart became very popular with the listeners and I subsequently kept maintaining it for a couple of years. During this time Will got me to sit in for a few of his shows, whenever he was away. While I did initially start off very nervously, I soon started to come to terms with what was involved with doing a show and other DJ’s started to encourage me to bite the bullet and have a go at doing a show of my own. Shows are always important to internet radio stations like 1 radio, as they need as many shows as possible to pad out their roster and this was when Synthopia was born in October 2012. I choose the name of Synthopia instead of Synthtopia to sound a little bit more unique, as the Synthtopia name was more common on the net. Synthopia kicked off with the simple principle of playing new synth-pop 80’s style tunes since the year 2000, because I loved the style of synth music from the early 80’s. I found the new music coming out not only complemented this well, it often has a very edgy and bold sound. After a year of doing the combination of a chart, a show and my job, I realized something had to give and I moved away from the Club 80’s show and its chart. I also knew that 1 Radio was soon to stop operating and the opportunity for me to operate independently appealed greatly to me, so I moved onto Mixlr.com to do my shows. The decision was pretty simple I was loving what I was doing with Synthopia and wanted to put all my energies into the show. I loved the bands and the people that were involved in the show and the chatbox factor was a lot of fun. I continued on Mixlr for almost two years, with a couple of short breaks. The last break was to end the Synthopia show as a part live show and to head down the podcast pathway, as my real life job now demanded an on-call factor and that clearly was not going to allow for a live factor. After my last break I returned with the new monthly show Skerat’s Eclectic Podcasts. I have used this name to have a truly unique show name, as Synthopia is also a brand of music software. Skerat’s Eclectic Podcasts is essentially carrying on the traditions of Synthopia and I now truly feel that I have also arrived at the genre range of the show. The collective genres are Synth-pop, New wave and Post punk, with that sense of that 80’s style, but with newer groups from around 2000 to the present day. The show also includes a one-hour blast of the past from previous Synthopia shows, which started off with the oldest shows and will continue that format in chronological order with each new podcast. Now as an added bonus this week I will re-post the playlist to show 7 of Skerat’s Eclectic Podcasts, as it includes all the links to the bands from that show. Last week I gave you show 8 and for now for the weeks that don’t include a new show I will continue to post the past shows.